Red Hen Press, 9781597091213, 272pp. 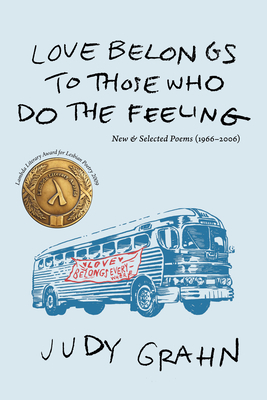 love belongs to those who do the feeling--an exciting collection of new and selected poetry by Judy Grahn. The book contains selections from Judy's entire body of poetic work from The Work of a Common Woman, The Queen of Wands and The Queen of Swords, to new poems written between 1997 and 2008. Judy's poetry is rangy and provocative. It has been written at the heart of so many of the important social movements of the last forty years that the proper word is foundational--Judy Grahn's poetry is foundational to the spirit of movement. People consistently report that Judy's poetry is also uplifting--an unexpected side effect of work that is aimed at the mind as well as the heart. Judy continues to insist that love goes beyond romance, to community, and that community goes beyond the everyday world, to the connective worlds of earth and spirit. Judy Grahn is a poet, writer, and social theorist. She currently serves as Research Faculty for the Institute of Transpersonal Psychology in Palo Alto, California. She is former director of Women s Spirituality MA and Creative Inquiry MFA programs at New College of California. Her books include love belongs to those who do the feeling (Red Hen Press, 2008), Blood, Bread, and Roses (Beacon Press, 1994), and Edward the Dyke and Other Poems (The Women s Press Collective, 1971)." I am thrilled that Judy Grahn's amazing poetry will once again become available to a new generation. She is a phenomenon--a fierce poet of witness and action, a visionary, with a tough and compassionate heart and a piercing intelligence, rooted in a spirituality that locates the sacred in the belly of the profane. And what a writer! Look at her wit, her compression, her ear for rhythms and sounds, her instinct for dialogic tension, her ability to compose large structures held together as in music by expected and unexpected recurrences, her common woman's twentieth century vocabulary along with ancient and archaic uses of language: naming as ritual, cursing, keening, spell- casting. Anyone who reads Grahn will be changed for life. Repeat: for life.